Car Information: Ford's styling for 1955 was entirely new and fresh. The crisp, clean lines, including daring new exterior color treatments, colorful coordinated interior upholstery patterns were offered in abundance. Trend setting trim ensembles and creative new body styling leadership propelled Ford to new levels of styling excellence. 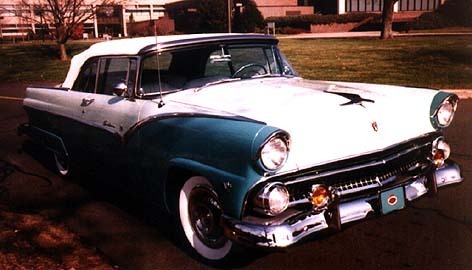 Of the many models offered by Ford in 1955, the Sunliner Convertible is my favorite. During this production year 49,966 Sunliner Convertibles were produced at various Ford locations around the world. It has been estimated that less than ten percent of this number exists today. Now, YOU have the opportunity to become the proud owner of ofthis magnificent vehicle. I now offer this distinctively beautiful automobile for sale. MY EYE CATCHING SUNLINER HAS MANY OUTSTANDING FEATURES WHICH ARE LISTED AS FOLLOWS. Manufactured June 7, 1955 at the San Jose, Califomia production facility. Two-tone Dupont Centari paint to original factory standards, both interior and exterior. Exterior colors, mountain green lower (rare spring color) and neptune green upper. ABC upholstery, including matching carpets. Deluxe radio and heater defroster - magicaire. Continental kit, including extra tire and rim. N.O.S. wire wheel covers (5) rare option. Fenderskirts. Road lamps (fog lightS) rare option. Drive train - 272 C.I engine, 53,000 original mileage, completely rebuilt with approximately 600 miles added since rebuilt. Standard transmission with overdrive. New 411:I differential gears, including bearings and seals. White wall tires, 5 Goodrich Silvertone 7.10 x 15 option size. Power steering. Fender mounted, side view mirrors Engine compartment finitely detailed to the highest standards. This automobile has been meticulously detailed to the highest degree of excellence. Eleven National Awards, including: AACA Hershey Senior, AACA Grand National 2nd, several AACA prcservations. Top Crown Victoria Association Awards within class in three separate meets. Five Best of Show awards in local competitions. The photographs associated with this advertisement reflect a beautiful and outstanding automobile. It has been said that pictures can tell a thousand words, this statement is true. However, seeing is believing! This stunning automobile exceeds expectations beyond one's imagination.